Want to sell your junk car for cash in New York? The Clunker Junker can help. The state of New York is the heartbeat of America, and in some ways the world. Whether it’s the big city driving the world’s financial direction, or the pristine natural landscapes upstate such as the Adirondack Mountains, New York has something for everyone. At The Clunker Junker, we have something for everyone as well. We pay cash for cars in New York state and it doesn’t matter whether it’s an old broken down work truck or a Toyota Prius used for commuting to the Big Apple. We buy all cars, trucks, vans, and SUVs, and we pay top dollar for them. If your car doesn’t run, we will buy it. If you need to sell your nicer used car quickly, we will buy that too. New York also has more professional sports teams than any other state or province in North America, and many of them are championship caliber. Well, except the NY Mets…or the Buffalo Bills - but we love them anyway! The point is, New Yorkers know how to win. That’s why when a New Yorker wants to sell a junk car in the Empire State, they contact The Clunker Junker. When we buy your car, you know you’ll be in good hands. We have a great reputation that we are very proud of, and our customer service cannot be matched in the industry. Look, we’re not always perfect, but we own up when we make a mistake and always make things right. Whether you’re looking to junk an old Buick or a newer BMW, you need to know a few things about your car. In order to sell your junk car in New York, tell us the exact year, make, and model of the car you want to junk. This info will give us a general idea on how much we can offer you, right up front. After that’s all squared away, we'll ask for the location of the vehicle, how we can get in touch with you, and if you have the title for the car. But don’t worry: We still pay top dollar for junk cars in New York, even if they’ve been through a dozen or two Upstate winters. If you like the cash offer we’re able to give you, the next step couldn’t be easier: click “Accept”! At this point, we'll need gather additional information about you and the car, like your phone number and pick up location for the vehicle, and in some cases photos to verify condition and ownership documents. Once we have that our local junk car buyer in New York will schedule a time to pickup the vehicle. After you accept our cash offer, in many cases we’ll schedule your vehicle for pick up within three working days or less. When the driver knocking on your door, he or she will give you your cash or check payment for your keys, title, and vehicle. Towing is free, so you can rest easy knowing there are no hidden fees. You have questions about selling your junk car in New York, we have answers. 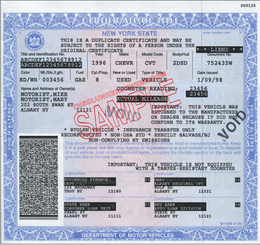 Do you buy vehicles with no title in New York? Sometimes, yes. Some of our car buyers in New York do buy vehicles without title, but not all. The buyers who do make offers on vehicles without title generally pay much less because the resale options are severely limited. At minimum you’ll need to prove you own the vehicle by showing a photo ID that matches a valid registration or insurance card. New York often changes their title documents from year to year. If you have questions about your specific title, please contact your New York DMV. We have put together a simple guide and example for how to sign your New York title when you are selling your vehicle. If there are multiple owners listed on the title, they must all sign the title unless the names are separated with "OR". When you're ready to sign your NY title, flip over to the backside. If you're the seller, you'll want to sign and print your name in "Section 1: Transfer by owner". Make sure you don't write in the buyer section or the home, boat, or out of state dealer section at the bottom. First sign the back of the title where indicated by "Seller's signature". 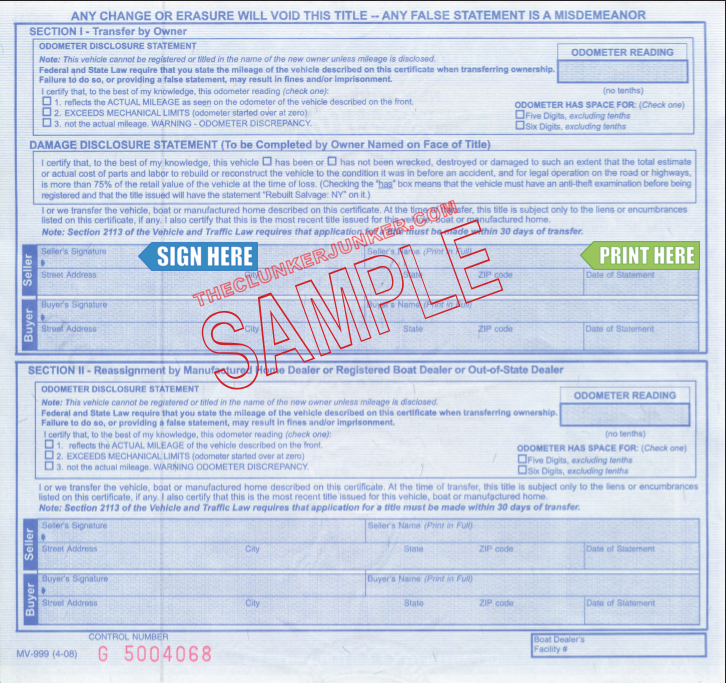 Print (don't sign) your name on the back of the title where it reads "Seller's name (print in full)". 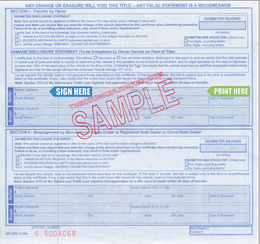 If eligible (click here to check), complete the online certificate of title replacement form. If not eligible, fill out the Application for Duplicate title Form instead. Please note that there is a 5 to 7 day waiting period before a duplicate title can be issued at your DMV and a 6 to 8 week waiting period by mail. The cost is $20.00. Getting rid of an abandoned vehicle in New York can be a difficult process. Unfortunately, you cannot just sell any junk car that ends up on your property if you do not own it. You'll need to follow the New York abandoned vehicle removal procedures. We have given a general overview of what that entails below. To have a vehicle removed from your private property, you must first contact local law enforcement. An officer will determine if the vehicle: has a wholesale value of $1,250 or less, is 10 or more model years old, has been abandoned for at least (1) one month, and is not stolen. If the vehicle meets all the requirements, the owner of the private property must submit a Statement of Abandoned Vehicle (MV-37) to have the vehicle removed. If the vehicle does not meet above stated requirements, an officer may determine to take the vehicle into police jurisdiction. You may not apply for a title to an abandoned vehicle in the State of New York. We buy junk cars in New York, here’s how much you can expect. We buy junk cars in New York, and virtually every junker that comes our way is accepted as long as it’s a complete vehicle. However, we do separate our junk cars into three separate groups when we figure out how much to offer you. If you can see the pavement through your car’s floor, then it likely belongs in our first category. These clunkers will probably be recycled by New York junk car buyers and junk yards for raw materials, so size and weight of the vehicle will determine the price. For these Flintstone-like rides, you might expect a $35 to $165 payment from us before we take it to an auto salvage yard. However, if your car isn’t entirely rusted out, then it might be what we call an “in-betweener.” These clunkers might still be drivable, but they at least have some parts we can sell off. However, we won’t know exact pricing until we get more info on your exact vehicle. Are you still driving around your junker to do grocery runs at Wegmans? Then you probably have what we refer to as a “This car isn’t junk!” type of ride. Because of these cars’ could be driven off a used car lot, these can be worth anywhere from $200 to $10,000. If you’re one of the growing number of New Yorkers that doesn’t need a car, then hawk over your unused ride to us for cash on the spot. Stop paying for that NYC garage space you really don’t need anymore, and get in touch with The Clunker Junker today! "I got into an accident back in February. It was a very minor accident, but my bumper popped off in one piece. It looks like it's directly from the screws, and my lights work, but the cover was broken off, and it used to run. I don't know if maybe something was left on, and the battery died, but after the accident, it was still running. There are two holes that I know of in the power steering container as well as the hydro one. Those are the only two things I've found to be wrong with the car. " "The car runs well and is still very reliable. The car has some physical damages that are repairable. It just had a tuneup and passed emissions. I also just payed for the registration for the year." "The car runs great. The body is damaged from both of my children learning how to drive in it. I have had the car for four years. It's an excellent, reliable car. I just want to junk it for cash for a new car." "The driver-side window no longer rolls up. We use a tarp everyday to protect it from the weather. The speedometer does not always work. We think the mileage odometer works, but we're not fully sure if it works right all the time. It shows about 160,000 miles." "The car was in an accident recently, and I only had liability insurance. The left front quarter panel is dented, and the bumper needs to be replaced in addition to some work being needed on the driver-side." "The vehicle will not start. We were told it could be the ignition switch. The car has been sitting for about a year, so we're not sure what else could be wrong with it at this point. We could not afford to get it fixed, and it's not worth it to us at this point. The car stopped turning on as soon as the car's title was transferred to us. We never had the title transferred, and the seller left the buyer section open. We are friends with the seller, so we can get any info necessary from them. " The Clunker Junker is one of the top junk car buyers in the state of New York. To date we have made instant offers on over 20 thousand vehicles across the state, totaling over $6.2 Million offered! 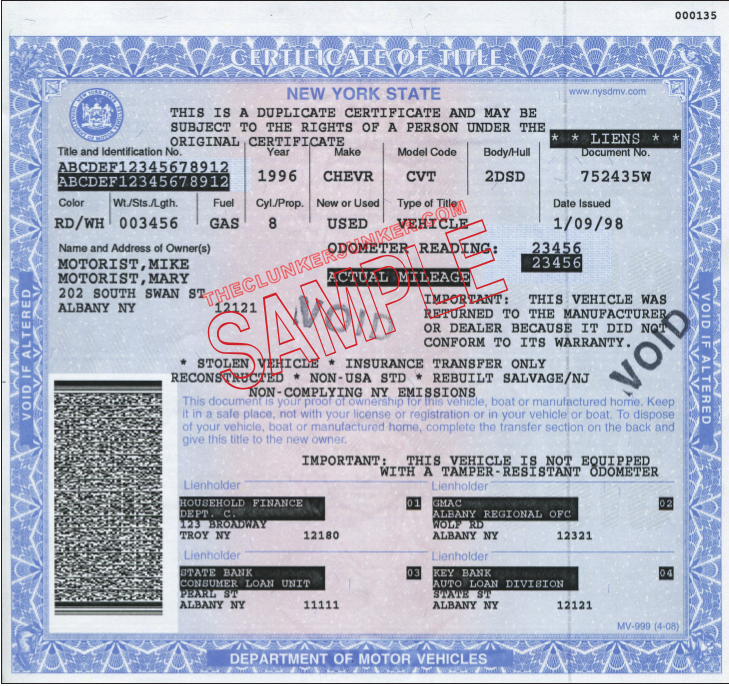 Of those vehicles, approximately 7% were purchased without a title. We also buy cars on a wide spectrum of conditions and 44% of the vehicles we've made offers on in New York do not start or drive. Many also have moderate to severe body damage. Buffalo in Scott County was our top producer, followed by Syracuse.